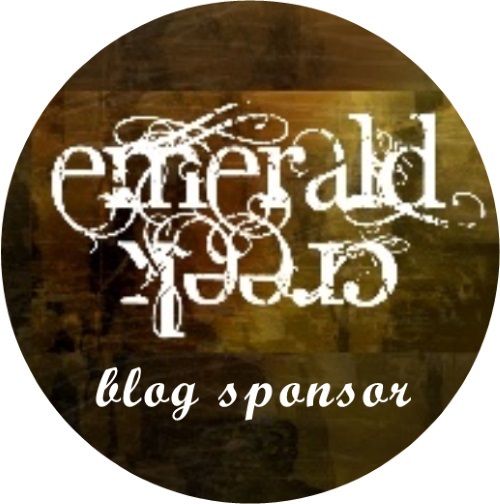 We very much look forward to seeing their creations over the coming weeks, but in the meantime please do hop over to see their fabulous blogs. With fireworks such a big part of the celebrations at this time of the year we are looking for you to create a Tim style project inspired by them. This may be using glitter, bold colours or ink and paint splats. Go on be creative, have some fun and light up that night sky! 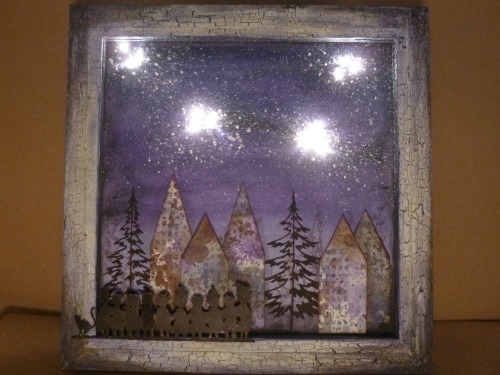 As usual we do not expect your projects to be Tim Holtz product based, but just to be inspired by him. Please do visit our Travelling Instructions for more information. Our challenge is a monthly one and a randomly chosen winner will receive a £20 gift voucher from our generous sponsor, Country View Crafts. We also award our Pinworthy badges to the Top 3, chosen by the Creative Guides who are subsequently invited to join us on the blog as a guest designer. The team had to get their thinking caps on for this one, but have some fantastic and inspirational projects to kick off the challenge. 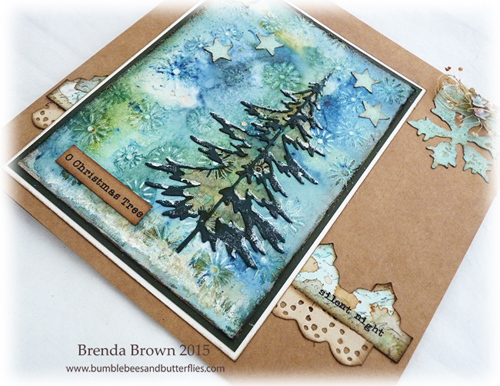 I used one of my favourite techniques on this card to highlight the colour of the distress inks in my night sky! Do pop over to Addicted to Art for all the details. 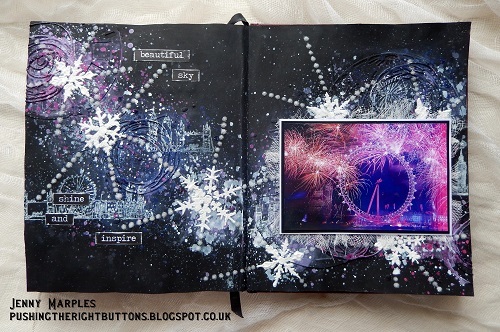 I started thinking about this challenge weeks ago wondering what I was going to make but once the Sparkles texture fade dropped through the letterbox I was off. The shape of the twinkles looked just like fireworks to me and I've added lots of bold colour and glitter too. My favourite fireworks are always the white ones. If I had my way, there wouldn't be any other colours (well, maybe the occasional golden one is allowed!). I've used a reversed 12x12 canvas to create my 3D scene and some tiny real lights to create the vivid explosion of light at the heart of each firework. It's another one which is hard to capture in one photo, so do come over to Words and Pictures to see the details. Living in the country our night sky is not polluted by street lights so any fireworks are always gorgeously bright against the darkness of the sky and stars. So I tried to recreate this feeling with a black gesso and texture paste background and rosettes made from Tim's rosette dies. The rosettes are made from painted strips of white paper (Rusty Hinge and Barn Door Distress Paints) with the paint pulled in one direction which transfers to the rosettes and looks as though they are spinning (which is very difficult to photograph!). Please hop on over to Live the Dream if you want to see some more details. What a great way to celebrate a holiday, with fireworks. I wish it was our tradition in the US as well. I decided on a journal entry for this one. I used lots of Tim's goodies here to light up the night sky. 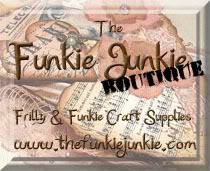 Please stop by my blog: My "Crafty" Life On The Internet to see how I did it. I absolutely love fireworks and the wonderful array of colours that light up the night sky. It's been a while since I played in my journal and this was too good an opportunity to miss. Disaster almost struck when printing out a photo of the London New Year fireworks display - the printer ran out of ink and resulted in an unusual effect! Turning it into a positive I went with those bold colours and created a firework display around them. See my blog for a step by step tutorial. 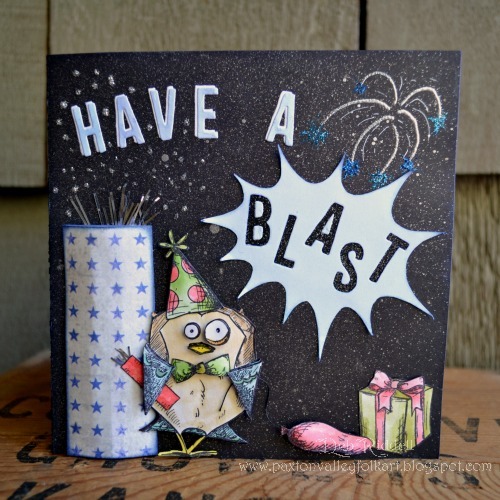 With the celebratory aspect of fireworks in mind, I decided to make a birthday card for my hubby using Tim's hilarious Bird Crazy stamps, Crazy Accessories stamps and lots of Distress inks, sprays and Distress Stickles. 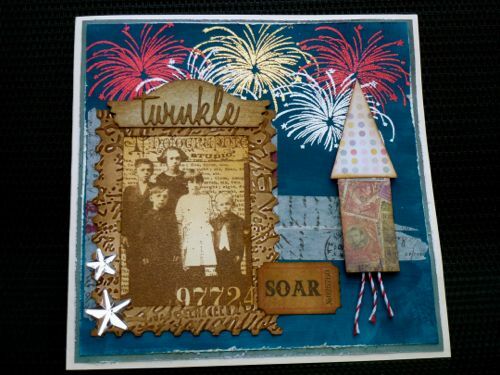 Come on over to my blog to see what mayhem ensues inside the card once that firework goes off! I so hope you will join in this fun challenge! 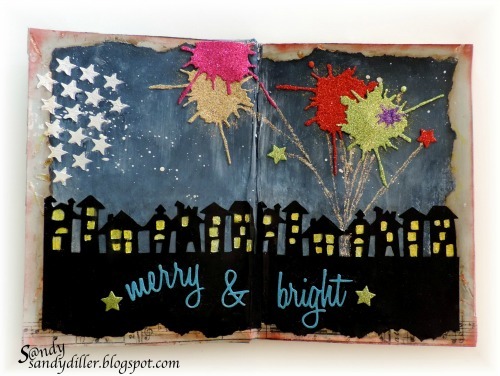 Don't forget, it is not about using Tim Holtz products, just to be inspired by him in some way. You have until Thursday 3rd December to enter and we will then select our random winner who will win a £20 voucher at Country View Crafts and our Pinworthies who we look forward to welcoming as guest designers. You can find all the Creative Guide projects, guest designers, pinworthies and winners on our Pinterest boards. Great make from the team and Deb has jumped right in with a fun Crazy Bird Creation. These are so much fun and so festive. What a great way to celebrate, with fireworks. A huge welcome to our new Creative Guides - it's brilliant to have you on board for the journey. And what inventive projects from the team for this theme - love how everyone's gone for a different approach on the fireworks, and they all look amazing! Thank you so much for the lovely warm welcome ! 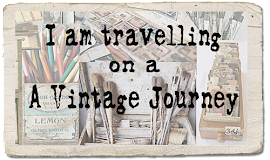 Ladies - I am so happy to be on board traveling the Vintage journey with you all (though I still can't believe it ) . What a fantastic gallery of projects for this months theme! Totally love all the diverse interpretations of the theme and the amazing results . I've been a"Pink" follower and now a VJ follower!!! Love this blog and can't wait to see what Pink does with this great opportunity, what a wonderful group of talent you have here!!! Beautiful projects and challenges. Way to go!!!! Super inspiration Teamies for this months challenge. A warm welcome to Amanda, Olga and Deb. So excited to see Deb on board! What a great choice for your team! Welcome to all three new Guides! I'm looking forward to seeing Amanda and Olga's work here! Great inspiration from the Design Team this time, with a very challenging and interesting theme! Hugs! A wonderful inspiration from the team! And welcome to the new creative guides!